This entry was posted in Fish Stories and Other Tales, Fly Pattern Recipes, Wet Fly Photos and tagged Black Prince, Classic Wet Flies, Don Bastian, Mary Orvis Marbury, Orvis, Penn's Creek, Ray Bergman, Trout. Hi Don, yes showing the trout something different definitely does work! …and it appears that flymphs are, as most techniques seem to be, straight out of the old school! Thanks for your “concurrence” with my view…thanks for the comment! Nice article and great fly Donnie! I think fishing larger wets would work really well for our fall run browns and rainbows. Going to have to give them a shot!! I know for a fact they would work…have a good story about Truman and his buddy killing the trout on the Bighorn…yeah that’s right! Those “finicky” “small-fly only” trout. Glad you liked it! Be sure to give some of these old classics a shot! Thanks Kelly, nice to hear from you and I’m glad you enjoyed the fly and info! Nice to see you tying and posting ….miss your classics sir! Nicely presented, DB. Your classic fly postings are always informative and well researched. A question about the wing on this one: Are the paired slips mounted with the tips up and out or up and together? It is a bit difficult to tell in this photo. I remember these flies, they were the ones for the ill-fated Bergman Collection on Classic Fly Tying forum that was never finished. …oh well, I got paid. 🙂 All the wings were tied as in Bergman’s book illustrations, tip up. And I personally tied them dull side, top-side out. Even though Bergman, in his very brief, how-to section on wets – not more than a few paragraphs, did tie them concave sides facing each other, as did George Harvey, Humphreys, and most other 19th century flies. When you have straight quill sections, they look good either way. 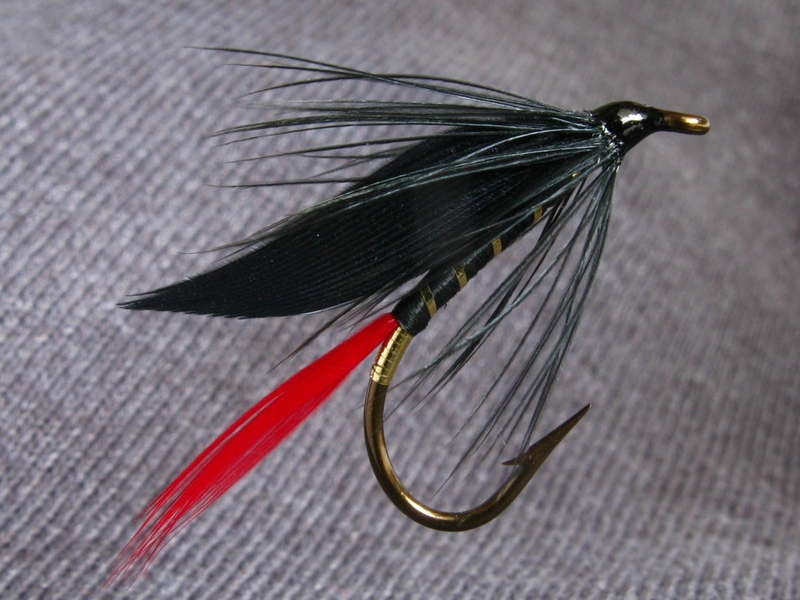 I generally prefer the divided wing, but have been doing more tying tip-down as in the 19th century Orvis flies. Thanks for your comments, glad you liked the post! That’s a good one Don – thanks, as always. They never get old. Thanks for your compliment and appreciation of the old flies…! Thanks! Glad you liked it! I have more info from my customer with additional fishing success with the Black Prince; on Penn’s Creek again and also Spring Creek. I’ll be making another post…thanks for your comment! Need to tie some of these. Thanks for the history a details on the Black Prince, Don! Thank you for your reblog of this post, and also “The Black Prince Rides Again.” Always nice to have help getting thee word out on classic wets. Thanks again! You’re welcome, Don. Love your work! I did reblog initially to my business blog by mistake and can’t undo, but did put a link to this post in the reblog of the “Black Prince Rides Again” at Gin Clear page. I do want to tie up a few of these as I love the classic patterns. I just presented my Moosehead Lake Region program last night at the Angler’s Club of Philadelphia. Of course I talked about classic wet flies and told some stories…they still work!!! Thanks again for your compliment, and for the sharing of the information!